An introduction to the Gemini Observing Tool (OT) is presented elsewhere. This page provides detailed information on GSAOI component, GeMS component and GSAOI iterator. Choice of filter is made by clicking on the "Filter" pull down menu (i.e. the down-pointing arrows). The filter is chosen by selecting one from the list (by clicking on it). The central wavelength is given for each filter to assist with identification. You can move the vertical slider bar or click on the arrow buttons to browse the list. The facility Cassegrain Rotator can rotate the instrument to any desired position angle (PA). By default the MASCOT automated asterism-finding algorithm (see below) will pick the PA that gives the best asterism that it can determine. To manually set the PA uncheck the "Allow Guide Search to select PA" checkbox in the "GeMS Guide Star Search" window (see (see Guide Star search algorithm below). Then the PA (in conventional astronomical notation of degrees east of north) is set by typing in the "Pos Angle" box. The view of the science field in the position editor will reflect the selected angle. Alternatively the angle may be set or adjusted in the position editor itself by interactively rotating the science field. The exposure time is set by clicking in the relevant window and typing the required number of seconds. Each occurrence of the observe element will cause N exposures to be taken and coadded in the instrument control system. The value of N is set by typing an integer in the "coadds" window. The total exposure in each output image will be the exposure time multiplied by the number of coadds. The GSAOI arrays are read in three different modes for different kinds of observations. Select the button corresponding to the desired mode (Bright Objects, Faint Objects, or Very Faint Objects). Note that the low noise reads, the read noise, the recommended exposure time and the minimum exposure time will get updated when a different readmode is selected. Details about the read out modes can be found in the GSAOI Detector page. GSAOI can be used "only" with GeMS. The GeMs AO component is automatically included in the GSAOI observation element. The GeMS component editor is accessed by selecting the GeMS component in the science program. Observers should choose the default values for "Atmospheric Dispersion Corrector" (disable), for the Astrometric Mode ("Regular). The Dichroic beamsplitter is set to 0.85 µm and should not be changed. GeMS uses 1 to 3 Optical Natural Guide Stars to compensate for tip-tilt wave front sensing ( CANOPUS WFS or CWFS) and plate-scale modes variation. One of the NGS is also used to compensate for the slow variation of the sodium layer altitude (CWFS3). The original design of GeMS includes a loop to compensate for flexure between the Canopus bench and the instrument based on the On-Detector Guide Windows (ODGW) measurements. However, it has been found that the flexure effects is really small during a typical GSAOI exposure. The selection of the ODGW for flexure compensation is not required anymore. Only the Canopus based WFSs (CWFS) must be defined. The CWFS are specified in the target component of the main observation. Information about the base position (i.e. the science object) and guide star(s) may be edited by clicking the appropriate line in the target table and then editing the various fields through the text boxes below. Changing the type of target may be done using the pull down menu at the middle left. General information on how to add guide stars can be found on the guide star selection page. By default the OT will automatically select the best asterism that it can find and place it in the Auto guide group. The Auto group cannot be edited. However, it can be copied into a editable Manual guide group using the Duplicate button ( ). Guide stars can also be added by clicking the green "plus" symbol in the target table. Manually-added guide stars or Manual guide groups can be deleted by clicking the red "cross" symbol in the table target. Double-click on a deactivated (greyed-out) guide group to activate it. Use the automatically-selected guide group if possible. You may fix the PA if required (see above). Finer control of the automatic selection process and manual selection of guide stars using the Position Editor is provided by the GeMS Guide Star Search dialog describe below. You should only need to type in guide star details if the stars are not found in either the UCAC4 or PPMXL catalogs. In the figure below the GSAOI detector arrays are the large squares (cyan) and identified with a number (the orientation is N-up, E-left). The GSAOI base position, defined in the target component, is marked as a small yellow cross within a circle. It is located at the bottom right corner of array 4, ∼7.6" from the center of the GSAOI detector arrays. The CANOPUS Wave Front Sensor (CWFS) probes patrol field area is represented by a large red circle with a radius of 1′, centered at the GSAOI base position. Note that the red circle indicates the area where the CWFS probes can move. The probes of the CWFS1 and CWFS2 are shown as a red rectangle in the figure. The probe of CWFS3 is located under CWFS1 and CWFS2 probes and is not shown in the position editor. Up to three CWFS guide stars can be used for tip-tilt wave front sensing. One ODGW star is shown, but this not required. As mentioned, CWFS guide stars are selected automatically. The asterism will update as the observation changes (e.g. rotation, position, offsets, conditions). You may control some aspects of the selection algorithm or pick guide stars manually by clicking the "Manual GS" icon in the Position Editor (or using the buttons located in the target component if the Position Editor is not already open). The automated search for the guide stars is performed using the MASCOT (Multi-Conjugate Adaptive Optics Tool) algorithm. The algorithm searches different catalogs for tip-tilt guide stars at given coordinates, compute the best tip-tilt guide star groups that will provide the best compensation (best Strehl) across the 2' CANOPUS field of view. The best asterism, based on the best average Strehl, is then selected by default. More details on the algorithm can be found in the How to find the best NGS Asterism web page. Note that in the automatic mode the selected stars cannot be removed. In automatic mode the "CANOPUS (CWFS)" is the default asterism search and the "UCAC4 Catalog" is the default catalog for MASCOT. Note that the bright and faint magnitude limits for the CWFS stars are R=8.0 mag and R=15.5 mag, respectively, in IQ70/CC50 conditions. In manual mode, the "GeMS Guide Star Search" window is displayed (upper panel in the figure below). The user can configure the catalog, the near-infrared band and the asterism (Canopus and GSAOI, Canopus alone or GSAOI alone) by clicking on the "Catalog", "NIR" and "Asterism" pull down menus respectively (i.e. the down-pointing arrows). By default the best position angle is found by searching for asterisms in increments of 90 degrees in PA. The PA can be fixed by unchecking the "Allow position angle adjustments" box. 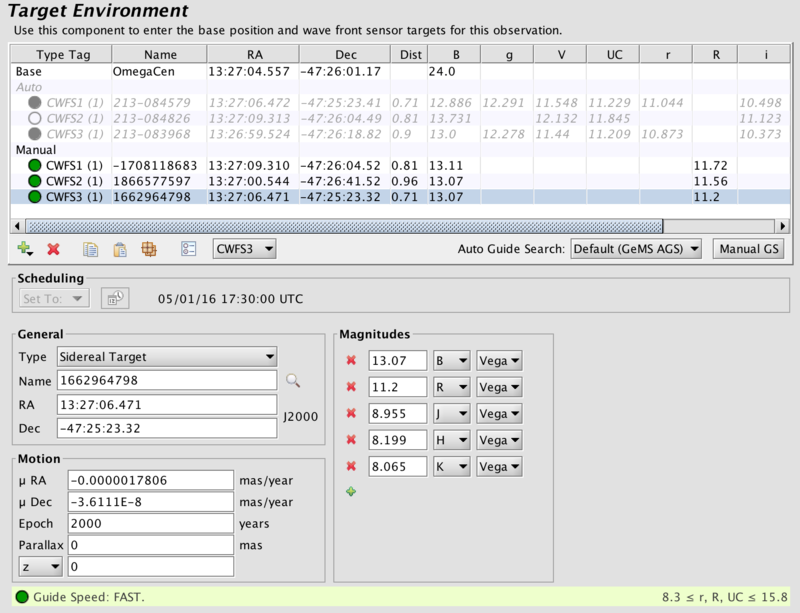 When a "Query" is requested, then a list of guide star candidates inside the CANOPUS field of view is given in the table (lower panel in the figure below) and displayed in the Position Editor. The list can be reviewed and modified. Clicking on a line in the table will highlight the star in the Position Editor, and vice-versa (see the example below). Guide stars can be selected manually by selecting one of the +CWFS buttons and then clicking on one of the marked stars. The information about that star will be copied to a Manual guide group in the target component. We recommend that you try the MASCOT selection first and then only do manual selections if MASCOT does not return acceptable results. By pressing on the "Analyze'" button (located at lower right of the GeMS Guide Star Search dialog) the MASCOT algorithm searches for the best asterisms and returns a list of candidates sorted by the average Strehl, the average rms and the maximum and minimum Strehl (see figure below). The algorithm can handle also sub-optimal cases. For example, it can return the best two-star asterism if a three-star asterism is not available.The user can also select more than one candidate asterism. When two or more asterisms are included in the target component, they are grouped separately. To add the candidate asterisms to the GSAOI Target Component, just press the "Add" button located at lower right in the figure below. Note that the selection of the ODGW for flexure compensation is not required and can be safely removed from the GSAOI Target Component. To remove it, select the ODGW star and press the "Remove selected" button in the target component. The selected asterism can be visualized in the position editor. In the figure below, the three CWFS stars and the ODGW star are marked as a small green square. The average Strehl ratio, the associated error, the minimum and maximum Strehl values, calculated using the MASCOT algorithm, and the FWHM for the selected filter and Image Quality condition are shown at the bottom of the position editor. The Strehl map is visualized in the position editor as narrow curved green/yellow lines. To visualize the Strehl map, the average Strehl ratio, the associated error, the minimum and maximum Strehl values, and the FWHM, click on the "Strehl" button located in the left panel of the position editor. The MASCOT algorithm returns an average Strehl ratio and the FWHM for the filter defined in the GSAOI Component and for the Image Quality selected in the Observing Conditions component. To estimate the average Strehl ratio and expected FWHM using different filters (e.g. J and H) and Image Quality conditions, the users have to change the filter in the GSAOI Component and the Image Quality in the Observing Conditions component. The calculation of the average "Strehl" ratio (and the visualization of the Strehl map) is performed automatically after a new filter and a new Image Quality condition are selected. Note the Image Quality Conditions allowed are IQ=20%-ile, IQ=70%-ile or IQ=85%-ile. Important Note: The average Strehl, the associated error and the minimum and maximum Strehl delivered by the Mascot algorithm are only indicative. The values are based on data collected during the GeMS/GSAOI commissioning (see Table 1 in the GeMS performance web page). The FWHM values provided by the OT are also indicative and based on the values listed in Table2 in the GeMS performance web page. The Strehl calculation derived by the Mascot algorithm in the OT does not take into account for example the laser guide star (LGS) photon return (this parameter varies seasonally), turbulence profile (Cn2(h)), non-common path aberrations and other AO optimization and calibration parameters. The Strehl and FWHM values returned by the OT may vary if, for example, the LGS photon return is too low or turbulence profile is dominated by high altitude turbulence. Only Canopus NGSs (CWFS) can be used for fast tip/tilt and plate-scale corrections. All observations must have from 1 to 3 CWFS guide stars for tip-tilt wave front sensing. The ODGW guide star for flexure compensation is not required. The CWFS guide stars must have the following limiting magnitudes: 8 mag < R < 15.5 mag. Detailed information about the selection of GeMS guide stars and the restriction in magnitudes can be found in the GSAOI Guiding Options page. The GSAOI Sequence Iterator is a member of a class of instrument iterators. Each works exactly the same way, except that different options are presented depending upon the instrument. The GSAOI iterators are required when the observation is stepping through different GSAOI components. Use this component to change the instrument configuration during the observation, for example, to repeat the same basic observation at two or more filters. In right panel of the figure below we see a few iterator features (the left panel shows the GSAOI Science Observation). An iteration sequence ("GSAOI Sequence" in the above image) is set by choosing "GSAOI Sequence" from the "iterator" menu. The table columns in the "GSAOI Sequence Component" are items over which to iterate (four in total). In the example given below, we are iterating over filters. Table rows correspond to iterator steps. When an observing sequence is started, all the values in a row are set at once. Since there are three GSAOI configuration steps in this example, an offset iterator is required. It would be embedded inside the GSAOI sequence iterator (see below). Then, an "observe" element would produce an observe command for each of three filter setups times the number of offsets defined in the offset iterator, using the specified integration time defined in the main GSAOI component. Rows or columns may be added and removed at will. Rows (iteration steps) may be rearranged using the arrow buttons. Rows can be added or removed by clicking "Add Step" or "Delete Step" buttons, and columns can be deleted by clicking "Delete Item". Adding column can be done by selecting one from the "Available Items" box. In the above figure, the iteration the table shows the observations for one of the filters. The first twenty exposures are taken with the step 1 configuration (in this case the J filter) with the telescope dithering at each exposure (p, q offsets). Note that in the first 10 exposures the telescope is dithering on-source, with all guiding loops in "guide" mode. For the next 9 exposures, the telescope is dithering "on-sky" (for sky subtraction), with all guiding loops in "freeze" mode. After step 20, the instrument is re-configured with the H filter for the next 20 offset exposures (10 on-source and 10 on-sky). The GSAOI Offset Iterator is a member of a offset iterator class. The offset iterator is common to all instruments and is used to define the sequence of dithers and sky offsets to be used. The offset sequence from the example given in the previous section is shown below. The offset sequence can be visualized using the position editor by clicking in the "offset" box at the Target menu. The different offset positions can be visualized in the position editor by selecting different steps in the figure below. This visualization is very useful to check if the selected guide stars are within the CANOPUS patrol field area and the GSAOI detectors during the observation. Detailed information on some of the considerations to be taken into account when setting up offset sequences with GSAOI can be found in the observing strategies page.